Albert Oliver Badman, progressive wheat farmer and Country Party politician, was born ‘alongside a wheatfield’ near Yacka in the mid-north of South Australia, on 18 December 1885. Oliver, as he was known, was the son of Robert and Agnes Mary, née Duffield. According to family history, Albert Oliver’s grandfather was George Badman, who had migrated from Somerset, England, with his wife and young family in 1857, taking up wheat farming in the district about 1872. Oliver was educated at the Yacka Public School. In 1902, when he was sixteen, his father died and with his mother and sister Beatrice, Oliver shouldered the responsibility for the management of the family wheat farm, ‘Greenwich Hill’. Feeling disadvantaged by his lack of formal education, Oliver continued to study for some years, obtaining private tuition from the Reverend J. H. Williams. His membership of three district literary societies, including the Yacka Literary and Debating Society, had earned him the reputation of being formidable in debate.On 15 February 1911 at the Yacka Methodist Church, he married Ann, the daughter of Samuel White, also of Yacka. Oliver and Ann would have four sons, Ronald Hallam, Wesley Oliver, Lancel Colis and Sankey Roydon. About this time Badman began experimenting with wheat to discover which varieties were best suited to the district. In 1916 his fellow farmers elected him president of the local branch of the Yacka Agricultural Bureau. By now he was a respected man of the district, serving as judge at country agricultural shows, and as a local preacher in the Yacka Methodist circuit (1915–47). In the 1920s he was among the first to own a car—a Studebaker. 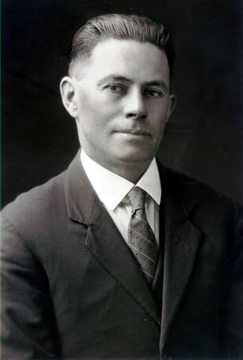 Between 1911 and 1931 Badman achieved considerable success in introducing new strains of wheat into South Australia and, with a growing reputation in this regard, lectured extensively on wheat breeding and experimental farming. He held annual field days at his property which became widely known as the ‘Greenwich Hill Wheat Experimental Station’. One such day in 1925 seems to have been particularly successful. Visitors included members of various branches of the Agricultural Bureau to whom Ann (with lady helpers) served afternoon tea. The occasion was reported at length in the Adelaide Register’s ‘The Man on the Land’ column. His activities, however, were not confined to Yacka. Exhibiting at agricultural shows in Adelaide and Melbourne, Badman won first prize in the South Australian Royal Agricultural and Horticultural Society Show in 1920 for his collection of rust-resistant wheat, and again in 1926 for newly introduced varieties. In 1924 he won a gold medal at the British Empire Exhibition at Wembley for his collection of 150 varieties of wheat. By 1926 Badman had let the farm on a share system and moved to Kensington Park, a suburb of Adelaide. The Register had described him as being in possession of ‘an indomitable will, perseverance, concentration and application’. These were good qualities for politics—in which he had become involved from about 1915, when he joined the Farmers’ and Settlers’ Association before going on to become a foundation member of the Country Party in 1917. Between 1924 and 1925 he was a district councillor for the Yacka ward of the Georgetown District Council, lobbying in government circles in Adelaide for improved post office facilities. In 1924 the Country Party selected Badman as a candidate for the seat of Stanley for the House of Assembly. Although he was unsuccessful, this was the prelude to a career that included election to both houses of the federal legislature. In 1929, in direct response to a personal request from Prime Minister Bruce that he should stand for election in order to keep Labor’s A. W. Lacey ‘pinned down and at home’, Badman, with only ten days to organise, stood for the federal seat of Grey in the House of Representatives. Though unsuccessful, he achieved over 40 per cent of the vote and came second to Lacey. In 1930 he tried again for the state seat of Stanley, and again lost. Nevertheless, his achievement in the 1929 federal election may account for the Country Party’s view of him as their ‘coming man’ when candidates were being proposed to the South Australian Emergency Committee, a group of non-Labor representatives set up to select candidates for the 1931 federal election for the purpose of tackling the Scullin Government’s economic policy. The Emergency Committee believed that South Australia’s economic difficulties could be traced to the failure of the Senate to act as a States House. Almost concurrently, Badman had been the Country Party’s nominee for the casual vacancy created in the Senate by the death of Senator Chapman. The choice of Henry Kneebone on 1 April by both houses of the South Australian Parliament had resulted in hostile feelings between the Liberals and the Country Party. There was also the fact, noted by the committee’s chairman, A. G. Grenfell-Price, that as Badman was ‘not a Pooler’, there was scope for conflict among the strong ‘Pooling’ interests of the Country Party. Badman was selected in third place, with A. J. McLachlan and J. G. Duncan-Hughes in first and second places respectively. In his campaign speech Badman referred to the ‘disabilities’ suffered by the primary producing states in being governed from Canberra. He saw the answer not in abolishing state government, but in the establishment of more regional centres whose increased rural representation would be reflected in the Senate. At the December poll, all the Emergency Committee’s candidates for the Senate and six out of seven for the House of Representatives, were elected. Grenfell Price, who had toiled long and hard for this result, felt Badman had performed ‘splendidly’ in the campaign. Badman, who was president of the South Australian Country Party for a period from late 1931, was one of four members selected to represent the party in negotiations with the Liberal Federation regarding the formation of a new body—the Liberal and Country League (LCL). Established in June 1932, the LCL was now in control of the preselection of Country Party and United Australia Party candidates in the federal and state spheres. Unlike similar organisations in other states, the LCL decreed that successful federal candidates could choose to sit either with the Country Party or the UAP. Of the ten successful candidates at the 1931 election, Badman alone chose to sit with the Country Party. In the Senate, Badman spoke seldom but proved a keen supporter of Australia’s key primary industries, particularly wheat. He described himself as ‘a protectionist, but not a high-tariffist’, although he supported the Lyons Government’s attempts to reconcile differing views within the UAP, and between the UAP and the Country Party, regarding the Ottawa Agreement. He said he would support the Lyons Government’s Financial Relief Bill of 1932, provided assistance came in the form of a bounty on wheat production or a reduction in overall transport and handling charges. But he opposed the Iron and Steel Products Bounty Bill of 1933, stating that the protection given in this quarter was more than adequate. On the Wheat Growers Relief Bill of 1933 he opposed, as did other members of the Country Party, the ‘doles for duds’ measure that accorded assistance only to those growers who did not receive a taxable income in the previous year, finding it ‘highly reprehensible’. And, as Grenfell Price anticipated, he maintained his opposition to the establishment of compulsory wheat pools. On 30 September 1937 Badman resigned his seat in the Senate in order to contest (for the second time) the seat of Grey. This was part of an arrangement between the UAP’s Philip McBride and the Country Party (anxious for seats in the House of Representatives). McBride, who had gained LCL endorsement to stand for the Senate, was looking for a casual vacancy and Badman provided it. Despite protests from the Labor Party, McBride was appointed to fill the casual vacancy created in the Senate by Badman’s resignation, and Badman was successful in the subsequent election. Duly elected, the former Senator Badman now represented the Country Party as the federal member for Grey. As in the Senate he spoke seldom and almost always on wheat and issues that affected the primary producer. He enthusiastically embraced a plan for the stabilisation of the wheat industry and encouraged the production of power alcohol from wheat, but objected to the Pensions Insurance Bill of 1938, which he saw as an ‘employees bill’. He supported piped water to Whyalla as an important step in the development of a ‘baby Newcastle in South Australia’. In 1939 Badman was drawn into the political turmoil in the Country Party that followed the death of Prime Minister Lyons in April. With Arthur Fadden, B. H. Corser and T. J. Collins, Badman was one of four Country Party members in the House of Representatives to disagree publicly with Earle Page’s vitriolic attack on R. G. Menzies on 20 April. Fadden and Corser immediately assumed independent status. At a Country Party meeting on 4 May, Badman, who had supported Menzies’ accession to the UAP leadership, threatened to withdraw from the party unless Page was replaced as leader. When this did not eventuate, Badman, with three others, carried out his threat; as a result when Page resigned in September the four dissidents were not permitted to participate in the election of his successor, who turned out to be Badman’s tempestuous fellow South Australian, Archie Cameron. More trouble was in store and Badman would be in the thick of it. When the Labor Party’s controversial amendment to the Defence Act, on conscientious objectors, came before the House, the coalition parties were again divided. Badman (with John McEwen, V. C. Thompson and Collins) voted with the Government and the Labor Party. Following an emotional outburst by Cameron against those who had supported the amendment, Fadden took the opportunity to speak against Cameron’s leadership, naming Country Party colleagues who were similarly disposed; these included Badman. This hostility to Cameron’s leadership contributed to mounting pressure, which finally culminated in his resignation in 1940. During the period when Badman ceased to attend Country Party meetings, he was described as UAP. However, following Fadden’s accession to the federal Country Party leadership, Badman was reinstated as a Country Party member, and as such was successful at the 1940 election. Badman’s experience in the House was wider than his preoccupations with wheat and the internecine squabbles of his party would suggest. As an MHR he was active on several committees including the Joint Standing Committee on Public Works and from 1941 to 1943 was a member of Prime Minister Curtin’s Joint Committee on War Expenditure. From 1940 to 1943 he was a temporary chairman of committees, a position he had also held in the Senate between 1935 and 1937. In 1943 he was a member of the Empire Parliamentary Association delegation that visited Britain, the United States and Canada. On his return he interlaced his campaign broadcasts for the August federal election with information garnered from his tours of wartime Britain, but was defeated, and went back to full-time farming at Yacka. In 1946 he recontested Grey, and again lost. That Badman maintained a keen interest in wheat is evidenced by his published pamphlets and frequent contributions to newspapers during his post-parliamentary years. In 1950 he was elected secretary/treasurer of the South Australian division of the Australian Primary Producers’ Union, having earlier served as its president. He was an official visitor at the coronation of Queen Elizabeth II in 1953, and two years later retired from farming. In 1958 he toured the Snowy Mountains Hydro‑Electric Authority. He moved to Adelaide in 1970 and remained an active member of the Grand Lodge of Ancient Free and Accepted Masons of South Australia. Badman was a handsome man with thick black hair and a steady gaze. His first wife, Ann, had died in 1952 and on 14 September 1955 he married Violet Hetty Nash at the Adelaide registry office. He died at the Winchester Rehabilitation Hospital in Adelaide on 24 April 1977 at the age of ninety-one, survived by Violet and the four sons of his first marriage. After a funeral service at the Methodist church, Yacka, he was buried in the local cemetery, not far from his birthplace. Badman ensured that his neatly written biographical notes and a small collection of memorabilia, including a fragment from the British Houses of Parliament damaged during a 1941 air raid, were left to the National Library of Australia in Canberra. According to a newspaper report, he possessed also ‘the daddy of all parliamentary autograph collections’. Badman Papers, MS 3710, NLA; Information provided by Diane Badman, Mount Osmond, SA; Ellis Papers, MS 1006/3–1, NLA; Letter, R. Badman to author, 2 Mar. 2000; Julie-Ann Ellis, Hard-Yacka: The Story of a Mid North Town in South Australia, Yacka Historical Group, SA, 1995; The author is indebted to the Yacka Historical Group for information; Register (Adel. ), 28 Nov. 1925, p. 14; Observer (Adel. ), 5 Dec. 1925, p. 5, 4 Apr. 1925, p. 6. Register (Adel. ), 28 Nov. 1925, p. 14; Ellis Papers, MS 1006/3–1, NLA; Ellis, Hard-Yacka, pp. 93–5; E. A. Herbert, A History of the Country Party in South Australia, BA Hons thesis, University of Adelaide, 1965, pp. 69, 72, 79, 81; A. Grenfell Price, ‘The Emergency Committee of South Australia and the Origin of the Premiers’ Plan, 1931–2’, South Australiana, Mar. 1978, pp. 5–47; Ulrich Ellis, A History of the Australian Country Party, MUP, Parkville, Vic., 1963, pp. 190–1; Advertiser (Adel. ), 3 Dec. 1931, p. 10, 16 Dec. 1931, p. 6. Age (Melb. ), 21 Dec. 1931, p. 9; Badman Papers, MS 3710, NLA; Herbert, A History of the Country Party in South Australia, pp. 83–4, 93; Australian Country Party Monthly Journal (Syd. ), 1 Oct. 1937, p. 15. CPD, 24 Nov. 1932, pp. 2760–2, 1 & 2 Dec. 1932 pp. 3378–82, 28 Nov. 1933, pp. 5043–4; Geoffrey Sawer, Australian Federal Politics and Law, 1929–1949, MUP, Carlton, Vic., 1963, p. 54; CPD, 7 & 8 Dec. 1933, pp. 5980–3, 5 & 6 Dec. 1935, pp. 2646–8. Australian Country Party Monthly Journal (Syd. ), 1 Oct. 1937, p. 15; Advertiser (Adel. ), 22 Oct. 1937, p. 22; Sawer, Australian Federal Politics and Law, p. 99. CPD, 10 & 11 Dec. 1940, pp. 747–9, 21 June 1938, pp. 2391–2, 1 July 1941, p. 608, 1 & 2 June 1938, p. 1727, 10 & 11 Dec. 1940, p. 838. Sawer, Australian Federal Politics and Law, pp. 100, 110–11, 126; Argus (Melb. ), 4 May 1939, p. 1; Gavin Souter, Acts of Parliament, MUP, Carlton, Vic., 1988, pp. 322, 326; Earle Page, Truant Surgeon, ed. Ann Mozley, A & R, Sydney, 1963, pp. 273–4, 281, 284, 290–1; CPD, 21 Sept. 1939, p. 952; Ellis, A History of the Australian Country Party, pp. 243–9, 252–7. Badman Papers, MS 3710, NLA; Advertiser (Adel. ), 24 Aug. 1943, p. 3, 25 Aug. 1943, p. 5; Ellis, Hard-Yacka, pp. 142, 145, 221; Advertiser (Adel. ), 25 Apr. 1977, p. 3; Badman Papers, MS 3710, NLA. This biography was first published in The Biographical Dictionary of the Australian Senate, vol. 2, 1929-1962, Melbourne University Press, Carlton, Vic., 2004, pp. 273-277.